CEO Rob McKay and (national operations manager) Russell Stone are a pair of bullies. Majority of stores are on brink of bankruptcy and still they send then henchman to breach franchisees for crimes such as not buying Wendys brand dishwashing liquid at $32.00 a box. Those 2 are going to rot in hell for what they are doing to hardworking franchisees. 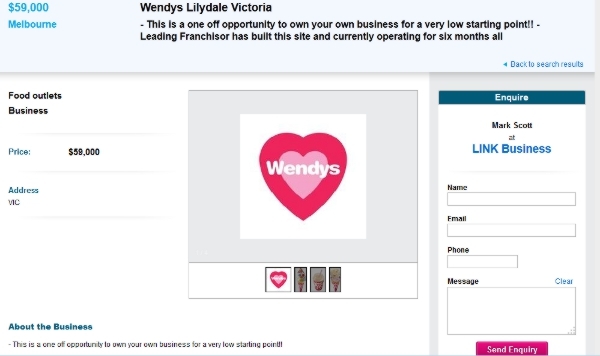 A number of Wendys Victorian franchisees have been listed for sale on online marketplaces over recent weeks, just days after Singapore-based Global Yellow Pages subsidiary Global Food Retail Group agreed to purchase the franchise network. The stores listed on Seek Commercial include Lilydale Marketplace, Horsham, Dandenong, Geelong Market Square, South Morang, Rowville and Wheelers Hill. SmartCompany understands one of the stores is on the market because the franchisee is becoming the state regional manager for Victoria and Tasmania, while another is leaving the company because of health reasons. The Lilydale store is listed with an asking price of just $59,000, while the Dandenong store is listed with an asking price of $70,000. The Wheelers Hill store is listed as having takings of $4500 per week with “low rent”, averaging out to just $80.35 per hour over a 56 hour trading week. 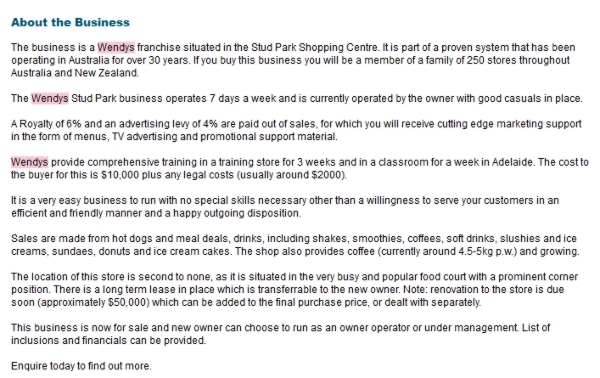 Meanwhile, the advertisement for the store at the Stud Park Shopping Centre in Rowville, south-east from Melbourne, lists a number of expenses that come out of a franchisee’s sales. “A royalty of 6% and an advertising levy of 4% are paid out of sales, for which you will receive cutting edge marketing support in the form of menus, TV advertising and promotional support material,” the listing states. A 6% royalty from $4500 is $270, with an additional $180 for marketing support, with the expenses coming before other costs such as rent, training, staff, and renovations. Along with the stores up for sale, SmartCompany understands the franchisee of an additional store at the Forest Hill Chase Shopping Centre decided not to renew the franchise after finishing up their lease. Overall, the company owns over 200 stores in Australia and a further 30 in New Zealand, with around 48 of those stores located in Victoria. Alongside the Victorian stores, a number of interstate stores are also listed as being for sale, including South Headland, Tuggerah, Mandurah, Busselton, and Sefton Park. When asked about the large number of stores up for sale, Wendys chief executive officer Rob McKay told SmartCompany the company was committed to its franchisees. “Wendys is committed to working closely with each one of our franchisees across Australia and New Zealand to help them reach their full potential, and continue to focus our efforts on delivering cost efficiencies wherever we can for our franchisees,” McKay says. The listings come after Wendys announced last month it was cutting the size of its stores to between 10-12 square metres in size, compared to a traditional Wendys format store, which is around 24 square metres. “We want to get sustainable economics into the shopping centre environment. One of the concepts we refer to is affordable traffic,” McKay said at the time. Late last week, the company announced a takeover deal with Singapore-based Global Food Retail Group, a subsidiary of Global Yellow Pages, with the new owners announcing plans to expand its network of stores into Asia. CEO Rob McKay and (national operations manager) Russell Stone are a pair of bullies. Majority of stores are on brink of bankruptcy and still they send then henchman to breach franchisees for crimes such as not buying Wendys brand dishwashing liquid at $32.00 a box. Those 2 are going to rot in hell for what they are doing to hardworking franchisees. If I had of got 59000 dollars for my store ,I would have been far happier than the 25000 I got . Being in a Wendy's franchise cost me my marriage , and led to bankruptcy. Wendy's great marketing plan was for the franchisee to give products away with nil reimbursement all in the name of 'growing the brand'.. From my experience ,Wendy's acts with a gross lack of conscience. Check out some of their past management who should be in goal but have fled like rats of a sinking ship !!!! APPARENTLY those 'Dunkin' Donuts' franchisees are also on shaky ground too ? Anyone care to comment ? I'm suspicious of any kind of franchise that costs 2-4 times the set-up costs of other similar sized turnover (or even bigger) businesses ~ I'm forever asking how they ever hope to turn over enough income to support them ? I'D want $5-10,000 A DAY to cover the exorbitant asking prices for some junk food franchises, rather than a week ! Especially considering the ridiculous rents that many shopping centres demand these days..
Wendys is a great advertisement for NOT getting into a franchise. Franchisees are losing their homes, retirement savings just to put money into the pocket of the bloated Head Office. You might want to ask how many stores are miles behind with rent and payment of other creditors including the banks. As for being "committed to working with franchisees" … give me a break. Why then are Wendy's products being rolled out into the largest service station network in SA in direct competition with franchisees? It's no wonder stores are on the market for these prices (and it's not just in Victoria)?! I'm a business owner who started from scratch and run a successful business. From reading the above, that's not a business. That's a dead end. Only a loser would buy something like that. Wendy's need to smarten up. Its not right or reasonable to sell such a poorly performing system as a "business." $80 an hour before all costs for the risk you take on. It wouldn't take long using your imagination to come up with something a thousand times better. I could not agree more. In fact, if only the truth can be said without being labelled or sued as defamation or inflammatory about what you comments on, there will be lots of reasons for accc to look at why franhisor are not required to have PDS disclosed, etc. franchise business contracts may be the only public / consumer contract that has the least protection for buyers although it could cost the buyer a house , a marriage , and even a live !!! That's is my comment . Very hard work to make yourself a wage in many franchises with the royalties and other costs, let alone make a financial return on investment. But it is possible, there's always exceptions. Depends a lot on the location of the store and foot traffic, and of course the owner not avoiding the uncomfortable hard bits of running the business.